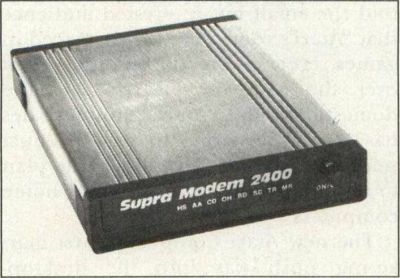 For those of you just not satisfied with talking to DELPHI, CompuServe or GEnie at 1200 baud, Supra has released its new Hayes-compatible 2400 baud modem (Supra 2400) for only $179.95. The unit is very compact. All of the usual user configurations are set by issuing commands from your terminal program, eliminating the use of DIP switches. The unit has two modular phone jacks and can auto-dial and auto-answer. The built-in speaker volume is programmable from your terminal program. The biggest feature of the Supra 2400 is its low price. Similar 2400 baud modems usually have a list price of $500 to $700. Supra has simple communications packages available for the ST, XL and XE systems. They are also supporting the Commodore 64/128, Amiga and Macintosh.